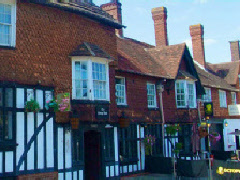 This Grade-II* listed building was undoubtedly one of the greatest coaching inns in the whole of England. In fact, it was as famous for its bare knuckle fighting and public hangings as it was for providing overnight accommodation for travellers between London and the south coast. Although much of the existing structure dates from the 18th century, it is thought that parts may date from the early seventeenth. Famous guests include Queen Victoria and Lord Nelson. The hotel boasts two restaurants, including one specialising in Thai cuisine (not something that would have been afforded to guests in the days of coach and horses, one imagines), and 84 guest rooms in all. Please note that at the time of writing, The George is referred to as the Ramada Crawley-Gatwick.